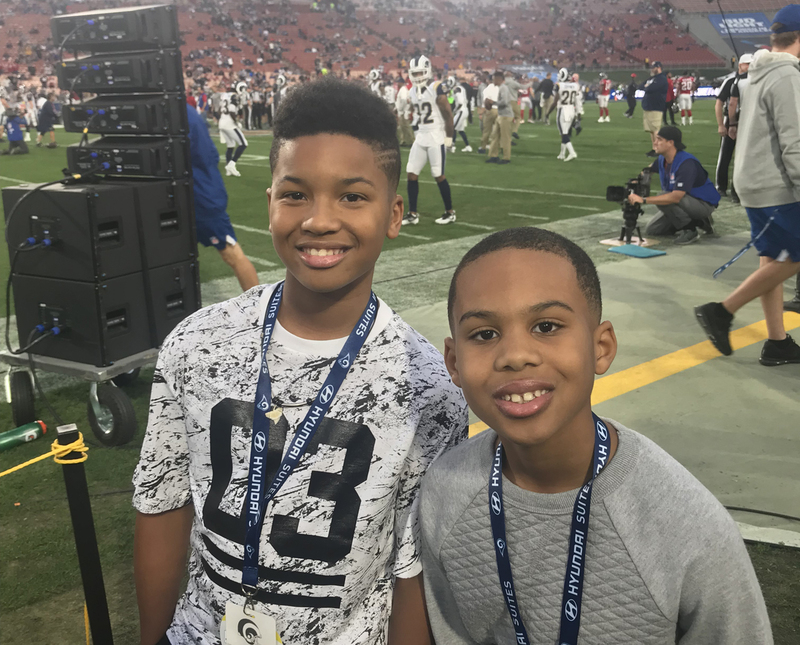 Last weekend, I had the incredible opportunity to take my sons Skyler and Kingston to the Rams/Falcons playoff game at the Coliseum. It was a great father-son day, to say the least. Believe it or not, I’ve never sat down and watched an NFL football game with them live, so that in itself was a memorable experience, not only for the boys but for myself as well. We were able to go down, talk and enjoy the game. But what’s more, we were able to experience the emotions of the game and feel the love, hearing the fans and watching the players and the way they all love the game of football. My boys got to experience the Rams vs. Falcons game last weekend live! It was exciting, and of course, as with anything in Los Angeles, it was star-studded. The best part was that each of my boys got to see their favorite team and favorite players in action. I spent the majority of my career, nine out of the 12 years, with the Rams, so I thought naturally both my sons would be Rams fans, because that’s the team I’m most often associated with. I never really thought about who they would be a fan of based upon when they were born. My oldest son Skyler was born and raised in St. Louis, so he’s naturally a Rams fan. But my younger son Kingston was born in Las Vegas, and by the time he was old enough to have memories of his dad playing football, I was in Atlanta with the Falcons. He was four or five years old then. So naturally, he hooked onto the Falcons because he recalls going to those games and meeting some of those players. I really never thought about it until I was having a detailed conversation with them, but it’s funny how each of them formed their own fandom based on their experiences. I even caught them arguing about it and posted a story on Instagram of them debating who was going to win the game. Both of them made very compelling arguments over who they thought would win and why they thought so. And a lot of it boiled down to the talented players on the field. Both teams were healthy, so we got a chance to see some of the real superstars of the game. That was really neat for the boys. Each of them got to see their favorite players, Todd Gurley, Julio Jones and Devonta Freeman. That’s their big three right now. So it was amazing for them to see all three of them live. 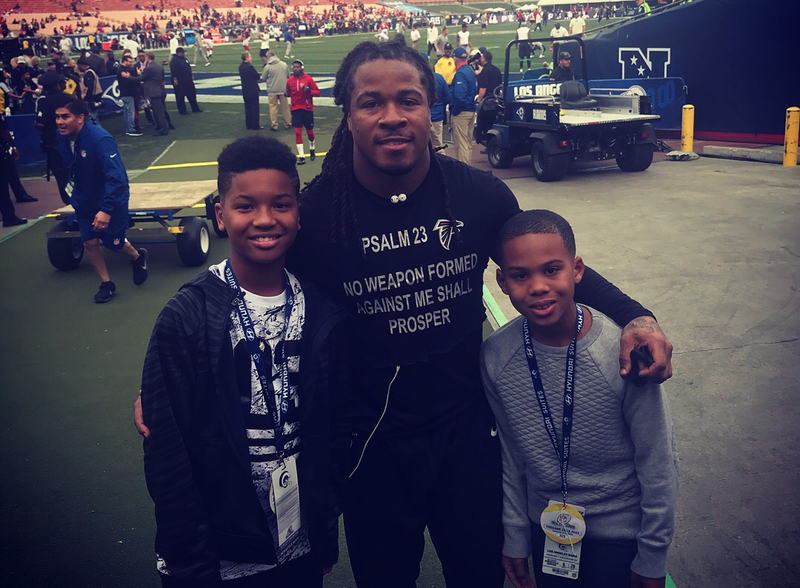 Shoutout to little bro Devonta Freeman for making the day of my two young men! But we were also lucky enough to go down to the sidelines and watch the pregame warmups so they could see how much work went into each game, practice and repetition, receivers getting in rhythm with the quarterbacks. I wanted my boys to see how preparation for the game is both mental and physical. That’s the key to the postseason, preparation and execution. And credit to the Falcons, they went out there and executed and won the game. It was impressive. I said last week that they weren’t as hot coming into the playoffs as they were last year. But they’re hot now, and they built some momentum that I think will carry them through this week. Which brings me, of course, to this week’s picks. One thing that stood out about the way the Falcons played last week was their poise. They played as a team that had been there before, because they had, just last year. Experience is a factor in the playoffs and head coach Dan Quinn has a ton of playoff experience, having been a part of a Super Bowl winner with Seattle. He understands how to get a team ready for the postseason and he has those guys ready, mentally in-tune, focused on doing their job in all three phases of the game. We know what they can do on offense, but the defense was stout up front and I was impressed with the play of the secondary in particular. Even when they did make mistakes they were able to remain calm and overcome them. That’s going to be key. For Philadelphia to win this game, they’re going to have to limit mistakes and lean heavily on playing sound football, do what they did all season-long, but have their defense be their strength. Get Matt Ryan out of his comfort zone of the pocket, flush him out, keep everybody in front of them and put Atlanta in third and long situations. The Eagles will have to keep Julio Jones in front of them to be successful (Getty Images). Don’t allow Julio and Sanu to make those big catches in the middle of the field or down the sidelines. It’s a tough task, especially in the playoff environment that Philly is unfamiliar with. If it turns into a track meet, I don’t like their chances with Nick Foles back there instead of Carson Wentz. This Eagles team actually reminds me a lot of last year’s Raiders when Carr went down. Just bad timing with that injury for a team that had such potential. This absolutely had the potential to be a great game if Wentz was healthy. They are a different team without him under center and the elephant in the room is: how is Nick Foles going to play? So I think the Falcons go in with a talent advantage at that key quarterback position, as well as the experience advantage that’s going to be tough to overcome. 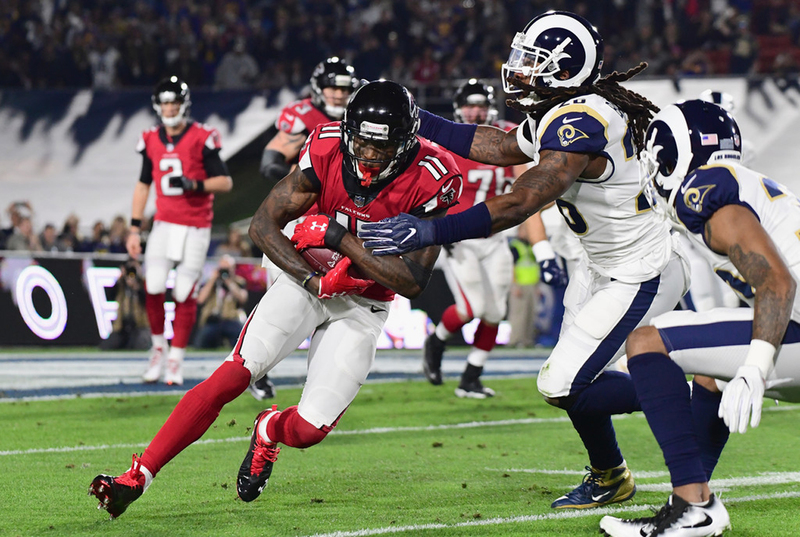 Not only do the Falcons have that playoff experience from going to the Super Bowl a year ago, but it also left a bitter taste in their mouth from the way it ended and you could see that hunger in the way they played last week. They want to get back there and prove it’s not who they are. That’s why they were able to come out on top last week and I think they’ll do the same in a hostile environment in Philadelphia this week against a very tough team. On paper, this is an interesting matchup. Coach Sean Payton and his quarterback Drew Brees are one of the most dynamic coach/quarterback duos in the league. But I’m really high on this group in Minnesota and don’t sleep on Coach Mike Zimmer and his quarterback Case Keenum. It has been a year to remember for that young man. He’s a guy who has been a journeyman for much of his career, but he got this opportunity and he’s really run with it and he’s shining. You can tell he’s really matured as a quarterback, but he’s also caught lightning in a bottle. 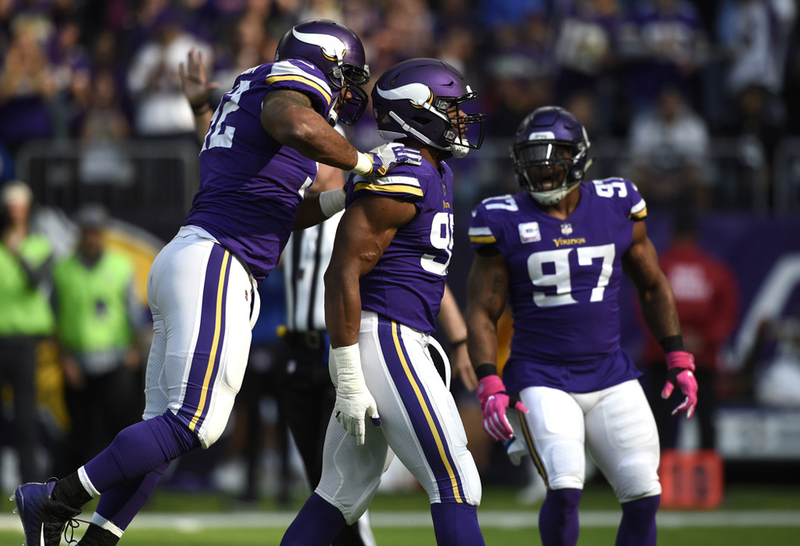 Coach Zimmer also has the Vikings just playing really good football, the best in the NFC at season’s end, in my opinion. In a close matchup, give me the better defense on their home turf (Getty Images). He’s a very aggressive defensive coach and he’s going to come after Drew, not let him pick them apart. The best way to do that is take away his timing routes and make him uncomfortable. With the high-flying guys of the Saints, you have to ground them and make them earn every yard. They’re going to make the Saints running game try to win the game for them and you’ll see the teeth of this Vikings defense there. The front is reminiscent of the Purple People Eaters of the old days in Minnesota, having that stout defensive line. The bottom line here is defense. As you get deeper into the playoffs, you realize how important defense is to winning a championship and I think Minnesota has the better defense, along with the home crowd behind them in this one. That should be enough to stop New Orleans and move on. The divisional round is when the big boys come to play. While the NFC is pretty wide open, in the AFC, New England and Pittsburgh seem to be, by far, the two best teams, destined to meet again in the AFC title game. When I was with the Patriots, it seemed that when the Pats hit the field, a lot of teams came out of the tunnel on the other side already feeling defeated, thinking, “What are Brady and that team going to do to us this time to put us away?” Guys tend to play not as loose as they should, and not as confident as they would against other teams. The Patriots just seem to have that aura, especially in the divisional round. But I would not count out Marcus Mariota and the Tennessee Titans that easily. I think they have a chance this week. One thing I realized watching the game last week is that, while these guys don’t have NFL playoff experience, they’ve played in big-time college programs, in big games, BCS title games. The bright lights and the pressure don’t necessarily phase them. The challenge is obviously different in the NFL, but I think those past experiences in prime-time allowed guys like Mariota and Derrick Henry to settle themselves down and have the needed poise. The more experience you get in those type of environments, the better you are at realizing that although it is a one-game season if you remain calm, execute and trust your preparation, all games are winnable and you can be successful at the highest level. You can’t count out Tennessee this week, but they’ve got their hands full (Getty Images). 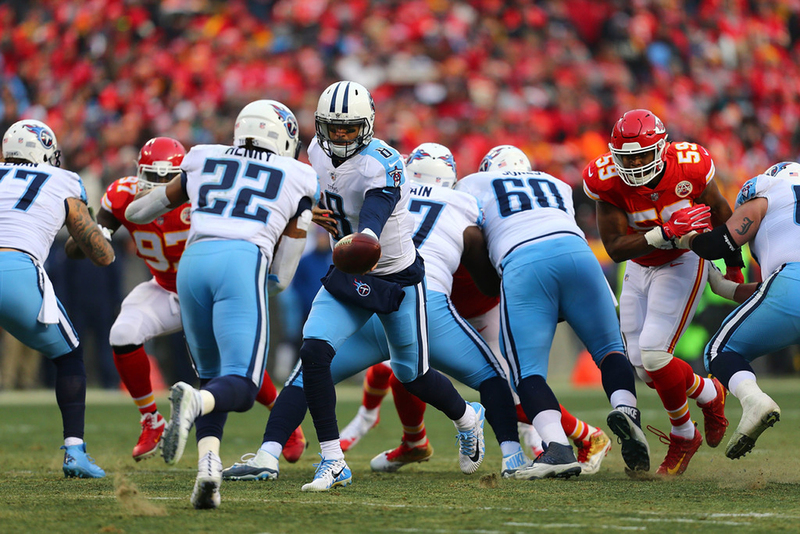 Mariota is a playmaker at quarterback and we saw him take a huge step forward in his growth and development as a player and a leader last week. He was able to make things happen, even when the play broke down, that we haven’t seen from a lot of these playoff quarterbacks. Henry also came in and ran the ball really well. They’re two dynamic players and winners. But the one thing we all know about Coach Belichick and his staff in his time in New England is that he’s going to scheme to take away your primary options. He’s going to limit the best player or players on an offense and make the role players step up and win the game. I don’t see who those guys are on Tennessee, so it’s going to be a tall order, at Foxboro, against a team as experienced and successful as New England Patriots. I’ll take New England in this one. This could be a really good one. Great offense vs. great defense. 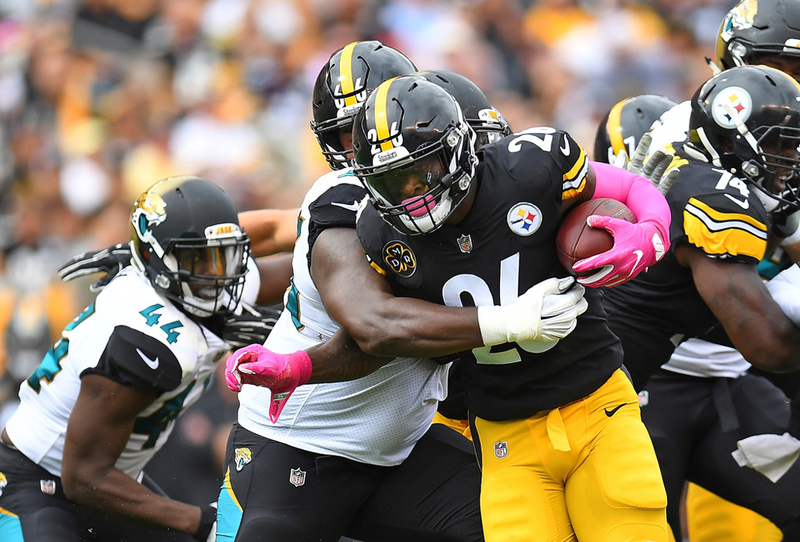 But between the coaching staff and the pedigree, Pittsburgh pulls it out over a game Jacksonville team that will put up a good fight. The Steelers just have more offensive firepower. Ben Roethlisberger, LeVeon Bell, Antonio Brown and that crew have been playing at a very high level all season long. For the most part, they’ve had consistency as it relates to health this season, too. That group, along with outside factors like weather and big-game jitters, seems like too much to overcome for Jacksonville this year. This is new to them. They’re going to be playing on a big stage. Jax already went to Pitt and won, but it won’t be easy in the playoffs (Getty Images). You can practice the scenarios over and over again, but when you haven’t been there, and it’s actually game time, and you know the world is watching, some guys who haven’t been in that situation tend to tense up. They want to make the big play and try to force things, instead of playing within themselves and allowing the game to come to them. Believe it or not, that cold weather is also a big factor, and as much as I’d like to see them make some noise and shake up the AFC, I think it’s going to be really tough on the Jaguars. Those are my picks for divisional weekend. Tell me what you think in the comments or on Twitter @sj39!